LIMA — Despite the current decline in gas prices, reimposed sanctions on Iran may eventually change prices, said Patrick DeHaan, head of petroleum analysis for GasBuddy. As of Monday afternoon, Allen County had the lowest gas prices in the Lima area at $2.418, 31 cents lower than the national average. 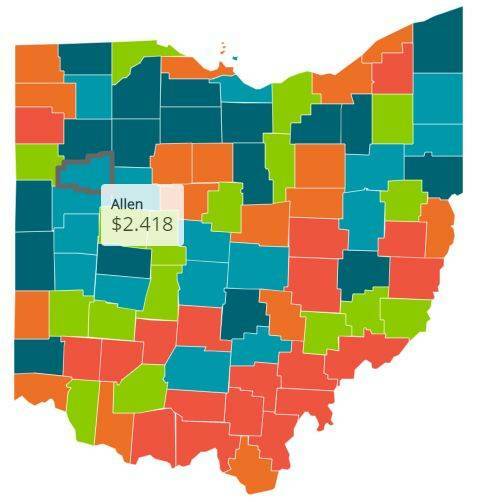 The county with the second lowest average gas price is Auglaize County at $2.442, followed by Hardin County at $2.443 and Shelby County and Mercer County at $2.462, Putnam County at $2.47, Hancock County at $2.49, Logan County at $2.514 and Van Wert County at $2.516. On Monday afternoon, the average price for a gallon of regular gas in Ohio was $2.51, which was 10 cents less than last week’s average. Sunday’s gas prices were 1.5 cents more than Monday’s average. Last month’s gas prices were 33.8 cents more than this month’s. Gas prices are 10.7 cents less than this time last year. Gas prices in the Lima region have gone up 3.4 cents since last week, according to prices reported to GasBuddy.com. Sunday’s gas prices were 17 cents lower than Monday’s prices. Regional gas prices are 27.7 cents lower than last month and 6.1 cents lower than last year, according to GasBuddy’s daily survey of 5,345 gas outlets in Ohio. The national average was 7.2 cents lower than last week’s average at $2.80. Sunday’s gas prices were consistent with Monday’s prices and last month’s gas prices were 17.9 more than this month’s. However, gas prices have gone up 20.7 cents since last year. This is the largest one-week decline in average gas prices in 2018 since April, said DeHaan. DeHaan said he expects gas prices to continue to decline, but warns that prices may change due to the reimposed sanctions on Iran.